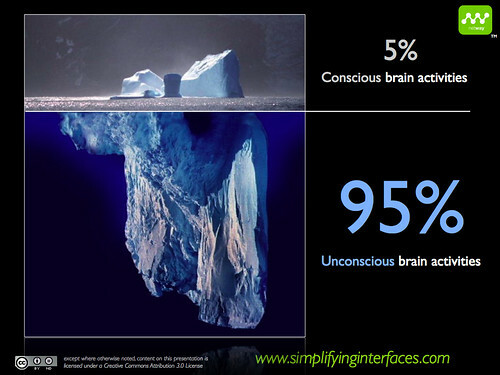 Numerous cognitive neuroscientists have conducted studies that have revealed that only 5% of our cognitive activities (decisions, emotions, actions, behaviour) is conscious whereas the remaining 95% is generated in a non-conscious manner. In my two previous posts “How does the brain work when confronted with an interface?” (episode 1 and episod 2), I have tried to vulgarize as much as possible the mechanism that is put into action when a human being is confronted with an interface. Today, I would like to add that 95% of these mechanisms are non-conscious and occur at a tremendous speed: they are indeed performed in milliseconds. Do you realize the muscles of your eyes are used to guide your vision (ocular movements are non-conscious)? Do you consciously enlarge the size of your pupil when a text is difficult to understand or when your have to choose a navigational button (the pupillary diameter is non-conscious)? Do you realize all the work performed by your different memories in order to analyze the content of a page (cognitive activity is non-conscious)? ”An enormous portion of cognitive activity is non-conscious, figuratively speaking, it could be 99 percent; we probably will never know precisely how much is outside awareness.” (Dr. Emmanuel Donchin, director of the Laboratory for Cognitive Psychophysiology at the University of Illinois). When building a site, it is important to know the motivation of users, the kind of tasks they will want to do on the site. Next, you need to decompose these types of behaviour and build screens that predict as much as possible the 95% of non-conscious cognitive activities (eye movement, mouse movement, decisions, emotions, actions,…). By predicting how users will perceive the words of your navigation, how the eye will non-consciously operate, what level of emotional involvement will be generated by the interfaces and so on, will allow you to build sites that lead to concrete business results. Knowing this, what to say then about user observation tests that do not take into account the 95% of non-conscious cognitive activity? 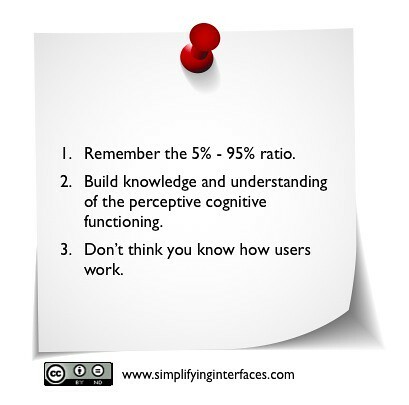 The answer: only 5% of our own cognitive capacities is used to observe user behaviour that is 95% non-conscious and that is expressed by thousands of perceptive cognitive interactions per second. That’s why methodology, tools, a thorough knowledge of the perceptive cognitive system is so important. Only this will allow you to collect objective data on a maximum of non-conscious activities. All the work done by my team members, whom I thank for their dedication and passion, is to work and develop techniques allowing to measure and predict part of this 95% of non-conscious activity and to be capable to use this to the benefit of concrete business results. The objective of my blog is to help people who are passionate about this line of work to evolve to a level of knowledge that exceeds usability. Let me finish by wishing you an excellent week. Could you provide a practical example of people rationalising a decision they have made?